Simnel Cake – a traditional fruit cake topped with a layer of marzipan and 11 marzipan balls. Find the recipe below. It’s not like me to post a recipe at 9 o’clock on a Sunday evening. Normally I’d be wrapped up in a blanket on the sofa by now, but today has been busy. For the last week I’ve been very, very poorly and for the first time in days I’ve had enough energy to do something other than lay on the sofa dozing in and out of sleep. After a morning of shopping I locked myself in the kitchen baking hot cross buns, a simnel cake and then my new favourite mac and cheese recipe. Having made so much progress in the kitchen I wanted to make sure I shared some of it with you guys before it was too later! Now Easter is a BIG deal in my house, and I mean BIG. A week before the big day, my Mum pulls out her Jesus Christ Superstar CD and we listen to it on repeat over and over and over again. Weirdly, when I moved out I found that I too felt the need to listen to it over again in the run up to Easter weekend. We keep Easter very traditional in my family, although we still give each other Easter eggs we also go to church, roast a leg of lamb and decorate the house with bunches of bright yellow daffodils! It’s a real celebration. It would seem that some of the older traditions are slowly slipping away. Every year my Mum, Nan and aunties complain about a lack of Simnel Cake in the supermarket and that when they do find them they are really expensive. After a lot of research, looking over family recipes and one or two from the internet I decided it really wouldn’t be all that difficult to make my own and so I posted this recipe back in 2012 after baking the cake for the first time. Pre-heat your oven to gas mark 3 and weigh out all of your ingredients. Cream together the butter and sugar, then add the eggs beating well. Fold in the flour followed by the fruits, mixed peel, nuts and spices. Once the ingredients are well combined, roll out your marzipan to roughly 2-3mm thin. Cut out a piece of marzipan the same size as the base of your cake tin. Roll the marzipan back into a ball and repeat. Place the remaining marzipan to one side to make into 11 equal sized balls later. Then leave the extra for making your 11 balls. Place a circle of greaseproof in the bottom of the cake tin and grease the sides. Pour in half of the mixture then place one of the marzipan circles on top. Spoon over the rest of the mix and level it with a spatula. Bake in the oven for 1 hour and 45 mins or until golden. When cooked leave in the cake tin to cool before turning it out onto your cake plate. Brush the top of the cake with athe jam and lay the marzipan over the top. Roll the 11 balls and using a little extra jam stick to the top of the cake. Finally either using a blow torch or by placing the cake under a grill, toast the marzipan until it is golden brown. I’ve toyed with mixing the recipe up – adding more exotic fruits, more booze, or perhaps chocolate – but I always think that if something’s not broken you shouldn’t try fixing it! My family love this recipe and they count on it being there Easter weekend. Why not serve up a classic to your family this Easter. Just in case you wanted a good giggle here are my original photos from 2012! Enjoy! Looks lovely, I might try it. Best wishes to Jon! Would you believe I only actually ate Simnel Cake for the first time last Easter. It might take me as long to progress to making my own but yours looks fab and I’m now off to look out my Jesus Christ Superstar CD! It’s not Easter without Jess Christ Superstar! :-p glad I’m not to the only one with a copy 😉 have a lovely Easter Claire! You’re right that it’s not so common to see this in the shops anymore, but your homemade version looks amazing, surely better than anything one could ever have bought anyway! Gorgeous! 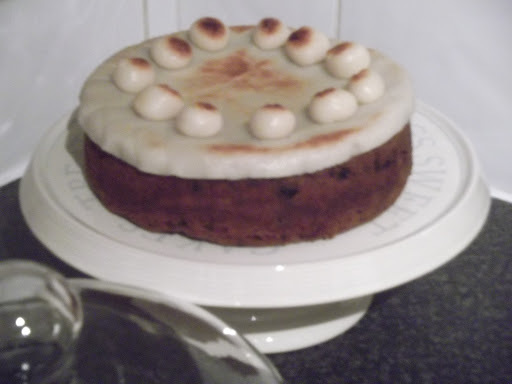 My mum loves Simnel cakes, I shall have to make her this one this Easter I think! Gorgeous photos, made me hungry! That cake is “almost” too cute to eat. It’s beautiful and would make a great centerpiece, that is then edible at the end of the meal! Thanks Kelly 🙂 I found thr little chicks in a nest and couldn’t resist popping them on top 😀 glad you like it! This looks delicious! I’m obsessed with marzipan and this looks like marzipan heaven!! I’ve always been so intimidated by simnel cakes, but this one doesn’t seem too complicated. Going to attempt this, though it won’t look as pretty as this one does! You know, someone just mentioned simnel cake, and I realized that I wasn’t quite sure what it was. So thanks, your timing is perfect for me! Aww thanks Anne you are very sweet. Feeling much better today! I’m glad you stumbled across my post 🙂 everyone should try simnel cake at least once! This cake is stunning!! OMG!! You’re so talented!!! Happy Easter! Thanks Ludmilla! You’re too sweet 🙂 I hope you have a wonderful Easter too! This cake is absolutely stunning and so festive! Love it! Haha thanks Kate :-p simnel cake and jess Christ Superstar is the perfect combo! Have a fantastic Easter!! !